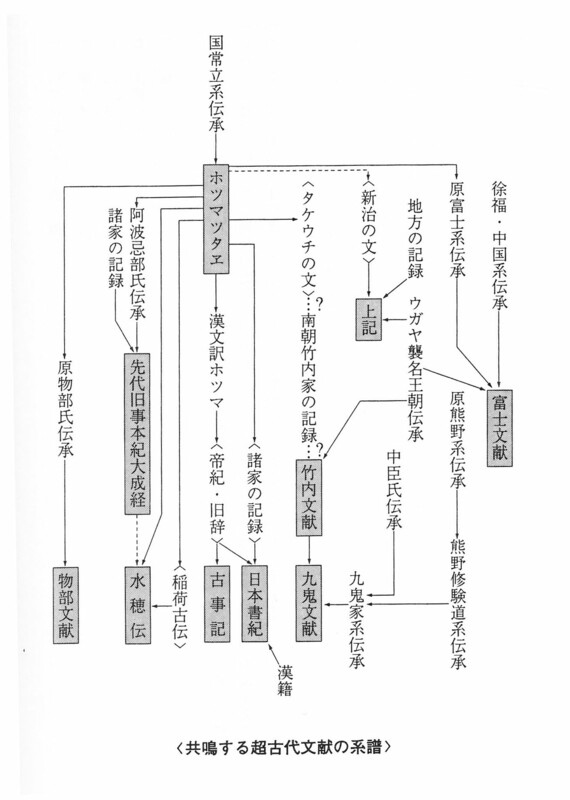 This document tree is from Torii Rei’s book. The shaded box at the top is HOTSUMA TSUTAE. MONONOBE / MIZUHO ONTSUTAE / KOJIKI / NIHON SHOKI / KUKI. For our post on Mizuho Ontsutae, please use the search box for our post. The shaded box above KUKI is the TAKENOUCHI set of documents. See our posts on Takenouchi. The shaded box to the far left of Takenouchi is the SENDAI KUJI HONGI TAISEIKYO. Here, Sendai means ancestor, Kuji means old things, Hongi means original or main book, and Taiseikyo is the Great Perfection Sutra. This document consists of 72- book and 32-book versions. Prince Shotoku Taishi (572 – 622) was the editor. There is an earlier Sendai Kuji Hongi which has ten chapters, already known in Heian times to be very old. The shaded box furthest right is FUJI MIYASHITA document. The shaded box to its upper left is UETSUFUMI, written in Hotsuma Woshite moji. The point of this chart is to show that there were many documents in the period prior to the publishing of the well-known classics, the Kojiki and the Nihon Shoki. Indeed, this shows how the documents relate to each other and also how their contents flow into the two classical documents. This entry was posted in Hotsuma, Takenouchi and tagged Documents, Fuji Miyashita, Hotsuma Tsutae, Kojiki, Mizuho, Nihon Shoki, Sendai Kuji Hongi, Takenouchi, Uetsufumi on 2013/09/16 by Okunomichi. Sarutahiko makes a tomb for Amateru at Manai near Asahimiya. Amateru says his kamuri headdress connected him to kami in heaven, his robes and sashes connected him to people and land. Isawa no miya, Amateru’s palace, is inland from Ise Naigu. Now called Izougu. Ikeda’s book describes his visit. ‘Amateru decided that the new capital would be at Isawa (now the Isomiya Shrine in Isobe, Shiki-gun, Mie Prefecture)’ [aya 6, HT by JTC]. The first miki (sake). Subichini lived in Shiga before she married. I-no-kuchi omiya, an unknown place. In the bamboo forest, she saw a sparrow eating rice in water inside a bamboo stalk. It tasted sweet and good. It was called sasake, sasa bamboo and keji foodstuff. Now we call it sake. 1 Kitsuyoji no aya; 2 Sakanori, making sake; 3 Koe, 12 wives; 4 Harumiya, Oshihomimi’s Koutaigu shrine, Harumi meaning East; 5 Takamanaru aya; 6 Namekoto nenchu gyoji almanac; 7 Hani (earth) matsuri no aya; 8 Toshi uchi ni nasu koto (matters to do before year’s end). 1st aya Kitsuyoji. Kitsu (east-west) yoji (4 threads). A teaching, using a weaving analogy, about Michi given by Amanokoyane (Lord Kasuga) at different places to nobles and people. Kitsu is blessing from sun and moon, coming and going. The country enjoys well-being when administrators and people follow the Michi. Kunitokotachi’s era was beginning of moji. Then the 48 sounds. Awa-no-uta was sung by Izanagi-Izanami. A-no-uta is Izanagi’s half, Wa-no-uta is Isanami’s half. They gave birth to the country and went around singing this song that clears up language. Wakahime, Hiruko, Amateru’s sister, was born on Tsukubayama. It was yakudoshi for Isanagi and Isanami who were 42 and 33, respectively. She was fostered by Lord Kanasaki and his wife Oshinazu. Both were waka poets and they ruled Kinki from Nishinomiya. 廣田神社, 兵庫県西宮市 Hirota Shrine (Hirota-jinja was the original name for Nishinomiya) in Nishinomiya, Hyogo prefecture, Japan. Oshinazu played awa, a child’s play with Hiruko. As we know Hiruko/Wakahime became a waka master. In her fifth winter she started studying akahanama, singing with instruments. She grew up healthy due to these vibrations. Ikura, five houses of the soul. People are made up of the seen and unseen. We have ikura, five kura, in our kokoro. We receive 3 kura from heaven/universe, called the tama; 2 kura from our parents, called shi. We are connected to our tama by the tama-no-wo cord. When we die, the wo is undone and returns the tama to heaven and shi to earth. Baby receives tama in the 5th month; it already has shi which becomes the organs. Tama consists of Miyabi (compassion, empathy for other people), Kokoroba, and Tama. Shi consists of Shi (ne, shizumaru, going down), and Ha (hiraku, widening). 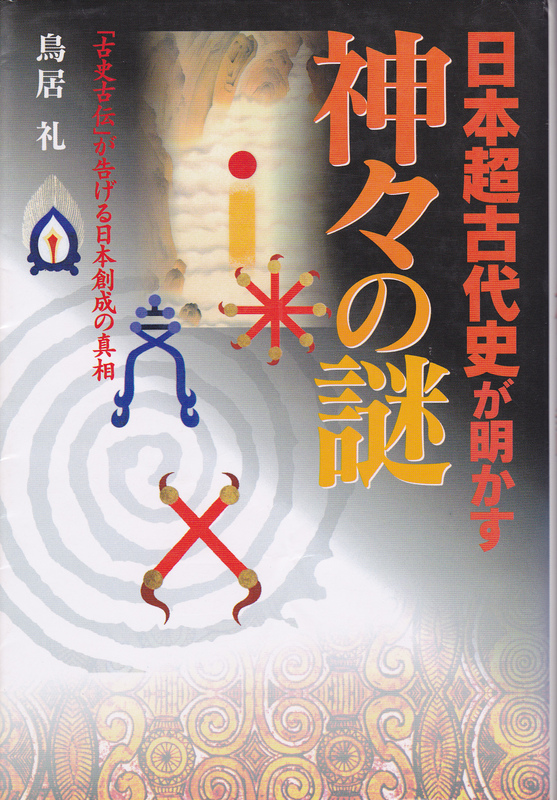 Editor’s Note: The above information comes from various of the books by Ikeda Mitsuru, in Japanese. This entry was posted in Hotsuma, Jinja, Mikasafumi and tagged aya, Mukatsuhime, waka, Wakahime on 2013/09/13 by Okunomichi. by Yamamoto Kenzo, born 1912, 1999 softcover book, 68 pp. Bought at Kuraiyama in 2011 for 1,000 yen. For reference, an oku-nen is 10^8 years, or 100 million years. Hida is the name of an ancient kuni land in central Japan. 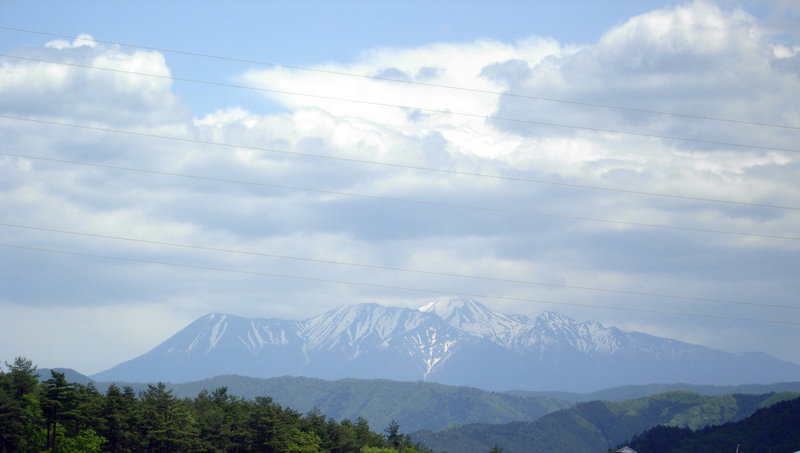 The Hida mountain range of Nagano and Gifu is popularly called the Japanese Alps. Geologically speaking, the land of Hida was born 20 okunen = 2×10^9 years (2 billion years) ago. Fukuchi Onsen in Oku-Hida has the oldest kaseki fossil stones, 4 oku 8 sen man nen = 4.8 oku nen = 4.8×10^8 years old. At that time, the whole earth was covered with a lot of water. 3,000 meter mountains were like islands. Hida Norikura yama’s main peak is Kengamine, 3026 m, the highest in the archipelago at that time. Mt. Fuji grew taller later, due to eruptions. At that time, only mountains taller than 3,000 m rose above sea level. 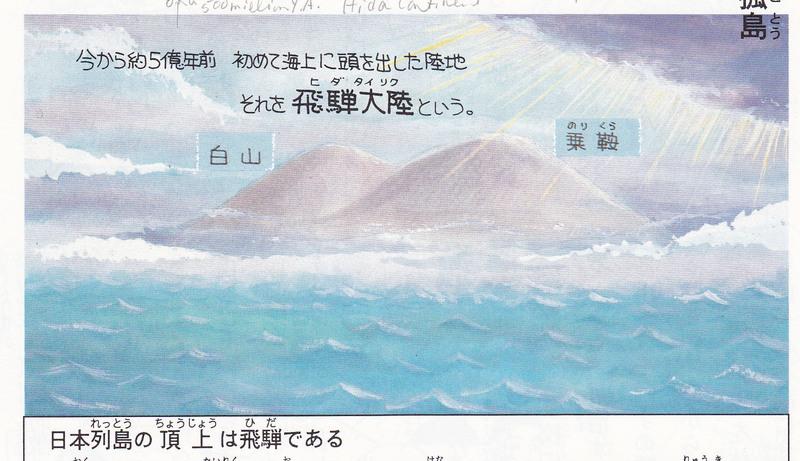 This book is mainly about Ohirumemuchi no Mikoto, who is better known as Amaterasu Omikami, and the continent of Hida. Yes, Hida was a continent 80 man-nen ago, 800, 000 years ago. The first Japanese people appeared here 700,000 to 500,000 years ago. They did not come from elsewhere. Yes, people arose in this land.They were born from water. Where did the water come from? From the moon. Awa no Uakata-sama, a sage known simply as Uakata (leader), revealed secrets to 23-year old school teacher Yamamoto (author of this book) in 1935. The venerable one was from a long lineage of uakata; uakata became known as Sumera Mikoto, the ancient title for emperor. Because Yamamoto had shown ability to heal people, Uakata-sama chose him to pass on ancient teachings with the promise that Yamamoto pass them on, in turn. Uakata-sama said that Hirumemuchi no Mikoto was a powerful woman whose dreams saved the country. Could she have been a shamaness or a spiritual master? She is also known as Amaterasu Omikami. 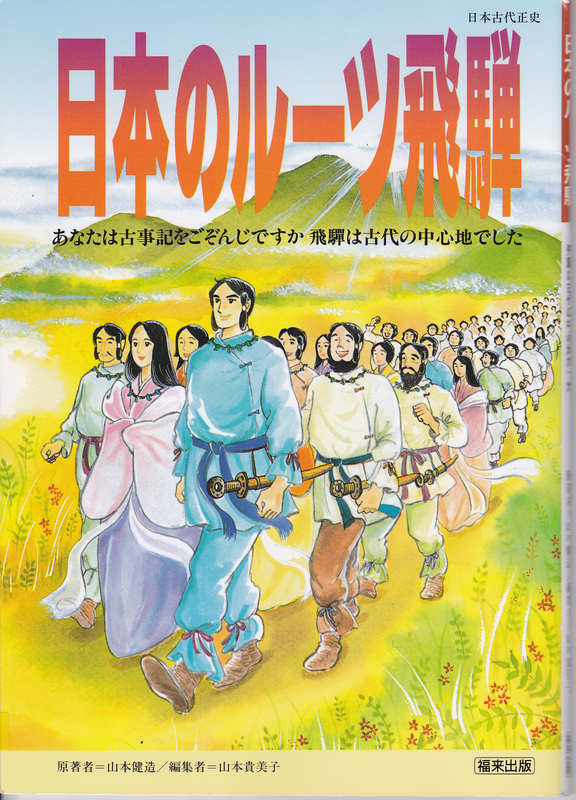 The theme of the book is the true history of how the Sumera Mikoto organized the people so that they could live happily with honor and compassion. This is the message that was entrusted to Yamamoto. Yamamoto listened carefully and studied the history of the area as well as geology. 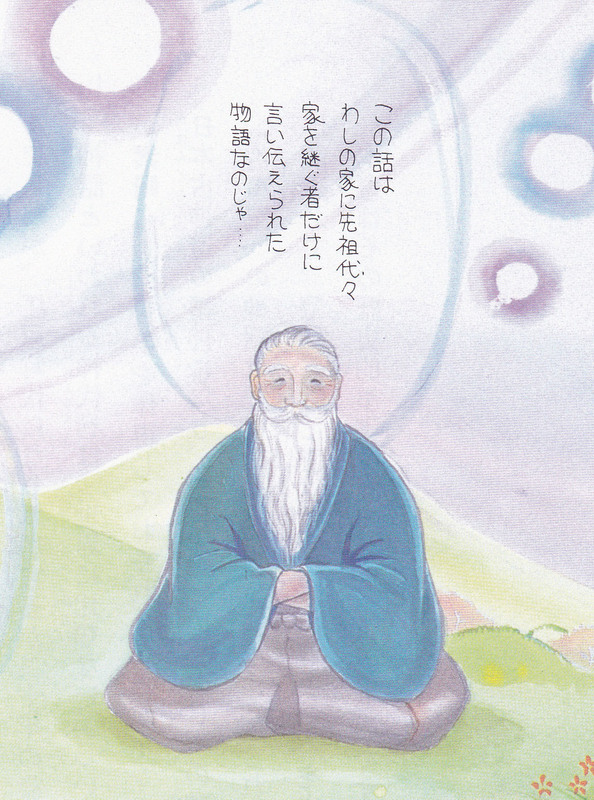 But time flew by and he found himself at age seventy hearing once again the voice of Uakata-sama. He was reminded of his promise. Yamamoto went around to places which he had heard of from Uakata-sama, and verified kodai-seshi, the true history of Japan before Jimmu. Yamamoto was eighty-five when he wrote this book. Mukashi, mukashi, long long ago, there was the land of O^yashima. On this land was Mt. Awayama = Norikura-dake. On this mountain was a pond, Nyu-no-ike. Life came out of this pond. All life appeared and evolved; land expanded and people appeared. We are all from Awayama. Awayama is Mt. Awa. ‘A’ means Heaven, ‘Wa’ means Earth. Life appeared from A-Wa. The old days were humid and hot. People went north where it was cooler, but grandchildren came back to HIda. The river Nyu-kawa was the entrance to Hida. When people died, they were buried in a place where they also built a pond (ike). 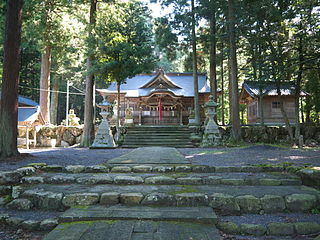 The Hida-jin people of Hida practiced a meditation called Mitama-shizume, calming the spirit. It is also known as Hidaki, holding (daki) the sun (hi). The name, Hida, comes from abbreviating Hidaki to Hida. The people would sit around the ike and gaze at the sun or moon reflected in the pond. This was practiced at Hidaki no miya. There used to be 30 such miya, now there are 19 shrines, all with Hidaki no miya in their name. 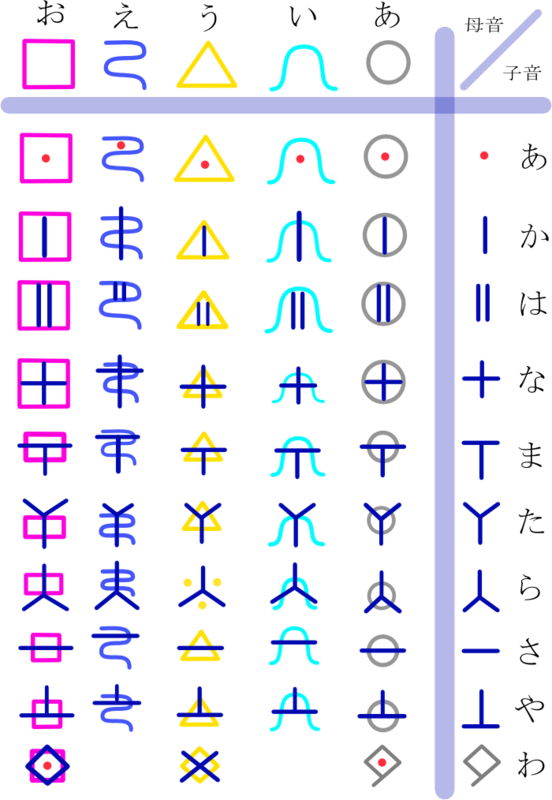 Here is a map showing 13 of these shrines. After the first ice age ended, it became 7 degrees warmer. Hida was cool and pleasant. The Hida people made votive objects called sekkan, stones shaped something like a one-layered wedding cake. They used them when praying for ancestors. At the end of the Jomon period, it became cold again with much snow. People moved to warmer places, and they lived happily. The 15th generation Uakata-sama saw that Hida was getting cold again, so they moved their miyako capital to Miyamura. Miyamura is at the foot of Kuraiyama. They took megaliths to Kuraiyama where they buried generations of Sumera Mikoto ancestors around the megaliths. This is why Kuraiyama is a sacred mountain and has many megaliths on it. The first Sumera Mikoto was named Kuraiyama no Mikoto. The ichii no ki, a type of yew tree, was used to make the board for writing the authority for the next Sumera Mikoto. This shows that there was writing in those days. We see the board today in the shaku held by the emperor and Shinto priests. The ichii no ki only grows on Kuraiyama. This board was called kurai-ita, Kuraiyama rank board. The second migration took place at the end of the Jomon period due to another cold wave. The Hida-jin made sekkan in reverse shape, i.e., with an indentation in the middle rather than a protrusion. About six dozen have been found in Hida, and dozens elsewhere in the islands. These are called gyobutsu-ishi. With these ishi, Hida-jin went south with ancestors’ spirits. What I notice in the story is the great reverence that Hida-jin held for ancestors. It is not ancestor-worship but rather, holding an honest appreciation for the contributions of generations before. This is done through the practice of meditating on the reflection of the sun or moon in the pond, or Hidaki. They would do this before making major decisions such as when and where to move. 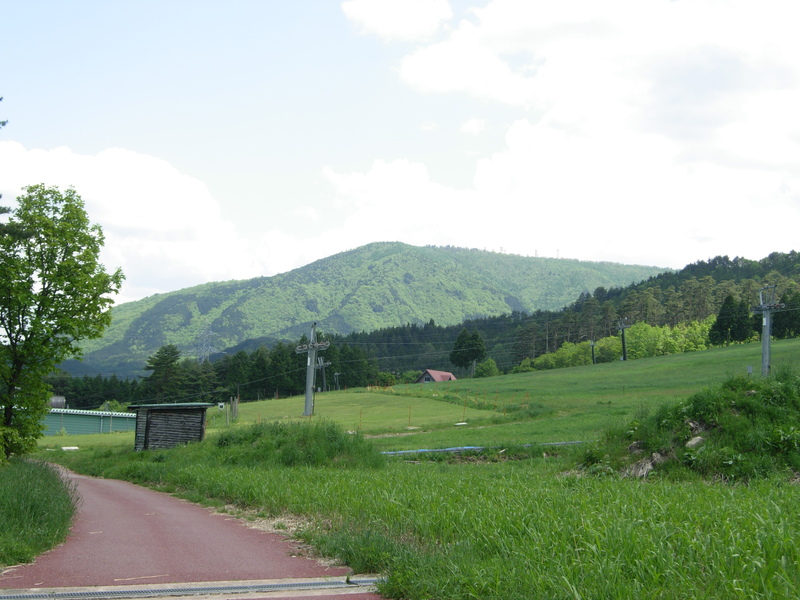 This entry was posted in Hida, Jomon, megaliths, Mountains, Takenouchi and tagged Kuraiyama on 2013/09/05 by Okunomichi.